Viking warriors like other people have a love of life, lore and weapons. We all know of Thor's Hammer in Viking mythology but it turns out Vikings were Masters of the Sword. Not just any sword - The Ulfberht. Best sword made at the time who's technology is rivaled only 1000 years later. A Ulfberht is a sword made with superior steel. It has a very even carbon distribution to make the iron strong, it has very little slag which could cause a sword to break, it was flexible and could hold it's edge. The sword is made to be as light weight as possible yet as strong as possible without breaking due to it's unique fluted design. The Ulfberht swords were inscribed with the word +vlfberh+t. Only the best warriors could afford a Ulfberht. 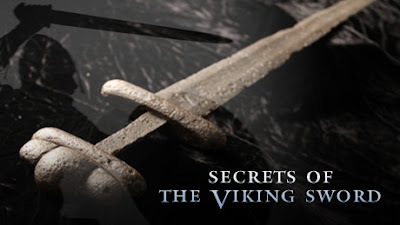 This sword helped make the Vikings the elite warrior conquers they are known to be. These swords were produced between 800 AD to 1100 AD. But until recently, it was unknown how Vikings actually made them - seeing as they did not possess the technology to produce one! This technology would not be rediscovered for industrial use for 1000 years.